If you were raised in rural Arkansas, you probably had a meal at a community general store. Thanks to Damon and Jana Helton, you can still do so at the Olde Crow General Store in Saline County. The Heltons relocated to rural Saline County in 2009 after Damon served five United States Army deployments in Iraq and Afghanistan. He was a member of the 75th Ranger Regiment, 2nd Battalion within the Special Operations Command. He worked in a military sales job after exiting the military, until the couple decided to try something different. They bought a farm. He said that he immediately began researching sustainable agriculture and attended training sessions on the topic to increase his knowledge and understanding of the practice. The family has been successful in its efforts, and is the West Central District candidate for the Arkansas Farm Family of the Year for 2018. Damon dreamed of operating an old-fashioned general store that offered a little bit of everything. 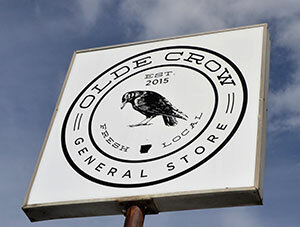 So, the Heltons bought a vacant store in the Crows community near their farm and named it Olde Crow General Store. Eventually, a table was added and made-to-order sandwiches were offered. Then another table was added, then another. Over time the Heltons removed most of the merchandise, and the store became a restaurant due to its popularity. The restaurant serves pasture-raised poultry, grass-fed beef and forested pork that is raised on their farm. The meats are all-natural, with no antibiotics and no hormones. Some of the restaurant’s signature ingredients are available to purchase. 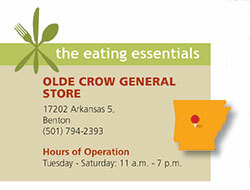 Olde Crowe offers a selection of Arkansas-made and Arkansas-grown products that showcase Natural State food artisans. The shelves are filled with homemade cakes, homemade pies, homemade cookies, local honey, jams and jellies, fennel and fire spices, salsa, pickled products and freezers full of poultry, pork and beef from the family’s farm. The Rubicon was the store’s first sandwich, named after the township of Rubicon where the store is located. This huge sandwich features pastrami, sauerkraut and Swiss cheese with Olde Crow secret sauce on toasted marble rye bread. The result is a very, very good take on a Reuben sandwich. The Boss Hogg sandwich is also a favorite. This creation includes fresh-shaved ham, two slices of Swiss cheese and two slices of American cheese grilled to a wonderful perfection and served on the store’s artisan bread. You will eat every bite. The Officers Club sandwich will have your attention! Next, I wanted to salute The Officer’s Club, as it ranks among one of the best club sandwiches I have sampled. 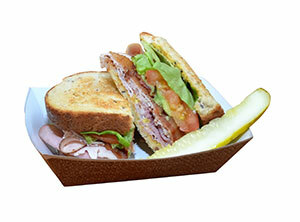 This officer is commissioned with shaved turkey, shaved ham, Barefoot Farm bacon, lettuce, tomato, avocado and the store’s special club sauce, served on toasted wheat bread. My absolute favorite was the Olde Crow Barefoot Burger, made with 100 percent grass-fed beef raised at the Heltons’ Farm at Barefoot Bend. The quarter-pound of freshly ground beef is seasoned with fennel and fire seasonings and grilled to perfection. You will taste the difference in the beef and love it. The homemade pies are made fresh daily. The selection of homemade pies changes daily, but includes apple, chocolate, coconut, egg custard, cherry and peach. Cobblers are also available. 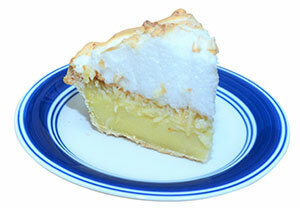 I sampled the coconut pie and the apple pie. My grandmas would approve.